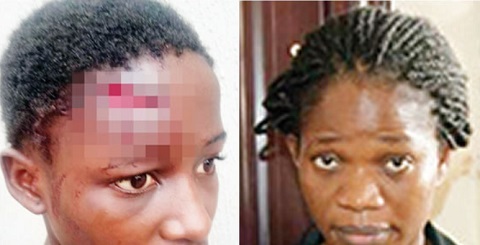 A female lawyer, Tolu Olaoye, has been arraigned by the Lagos State Police Command for allegedly inflicting a cut on the forehead of her maid, 15-year-old Abigail Opebiyi. The victim lived with Olaoye on El Shaddai Crescent in the Ipaja area of the state. Olaoye was arrested on Friday on the directive of the Commissioner of Police, Edgal Imohimi, after a video of the assault went viral. She was taken into the custody of the gender section of the state police command in Ikeja for interrogation, while the girl was rescued. The 32-year-old lawyer was charged with two counts before an Ikeja Magistrate’s Court on Monday. Although the incident happened on December 1, 2017, it was said that neighbours of the lawyer became aware of the injury on December 14. Olaoye was said to have kept the girl indoors after inflicting the injury on her until she came out on that day. A police prosecutor, Inspector Simon Imhonwa, told the court that the offence contravened sections 170 and 171 of the Criminal Law of Lagos State, 2015. The charges read, “That you, Tolu Olaoye, on December 1, 2017, about 8pm, at 5, Elshadai Crescent, Baruwa, Ipaja, Lagos, in the Lagos Magisterial District, did unlawfully assault one Abigail Opebiyi, 15-year-old, by beating her, thereby committing an offence punishable under Section 170 of the Criminal Law of Lagos State of Nigeria, 2015. Her counsel told the court that the victim’s father, Femi Opebiyi, had agreed to withdraw the case, a move the father corroborated before the court. After standing the case down for some minutes, the presiding magistrate, Mrs. B.O. Osunsanmi, later adjourned the case till February 1, 2018, for report of settlement. She granted bail to the defendant in the sum of N200,000 with two responsible sureties in like sum, adding that the addresses of the sureties must be verified.